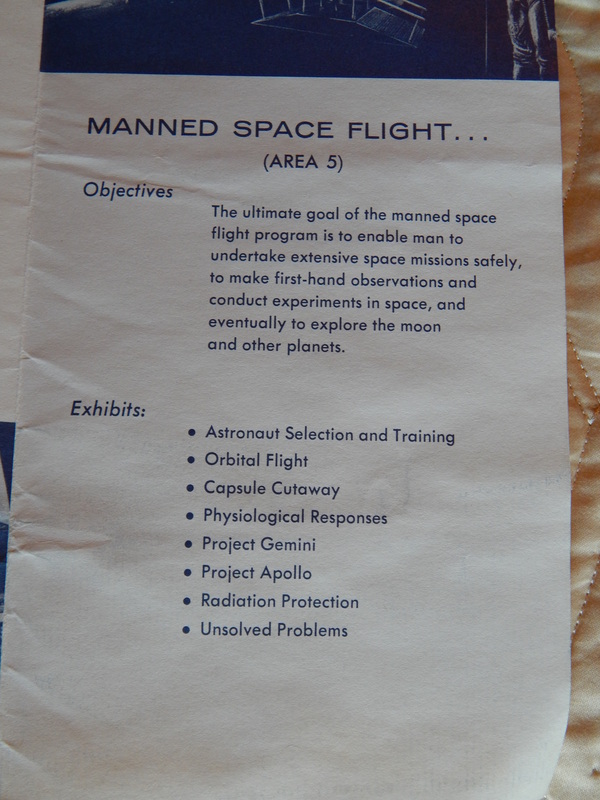 You never know what you will find at an estate sale. I went to one this weekend in search of some Seattle World’s Fair Bolo tie items. 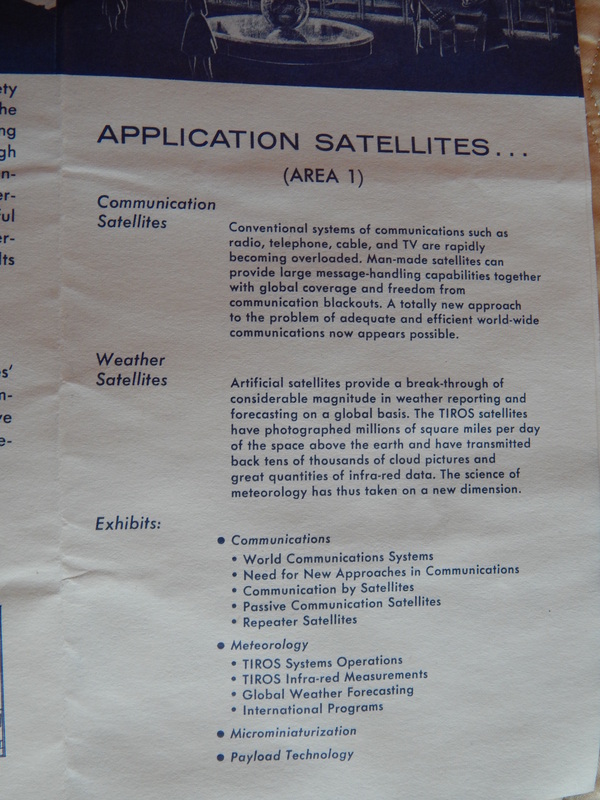 n the pictures they were still on the display cards – three of them looking like new old stock. So nice I even wondered if they were knock offs and not authentic 1962. I got to the sale right at 9am on the opening day and only 10 people in line. I was excited, cause that meant I had a chance. WRONG!! They only let 5 people at a time in. 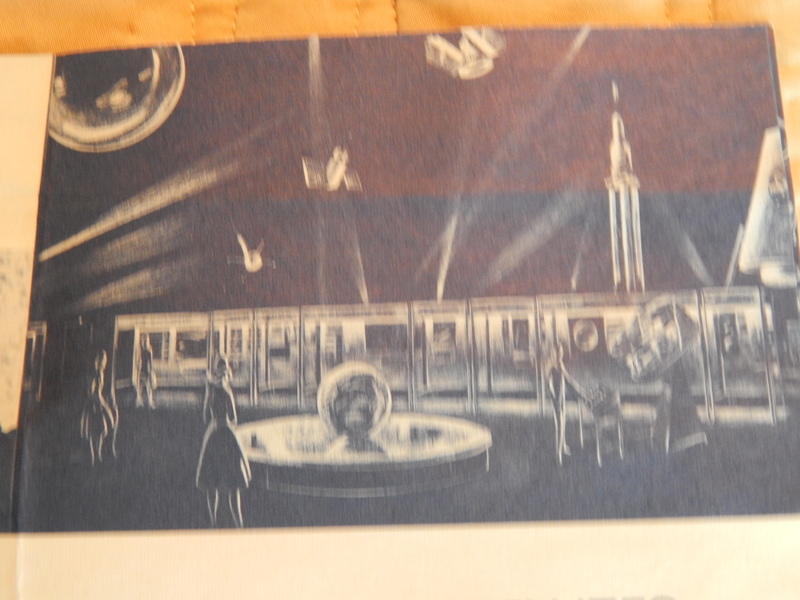 I was in the second group and the lady running the sale told me those Worlds Fair items were first to go. She did point me to some glasses she still had up on the shelf. I scored a US Science Center frosted tumbler that I was missing in my set of glasses. Then I saw the spoons. There was a pile of about 10 on the lower shelf and another guy was pawing through them. I think he was grabbing them for the silver but my hand was steady when I saw the one with engraving in the bowl of the spoon. 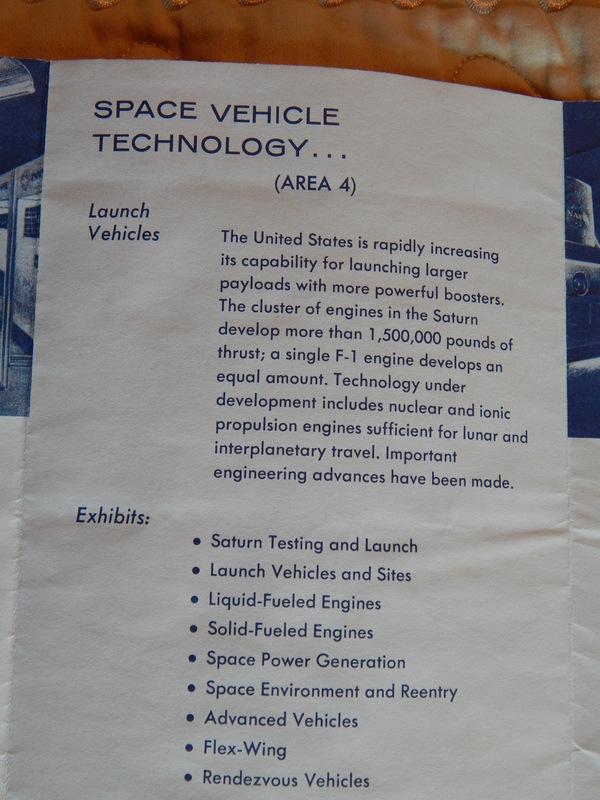 That is often an older worlds fair item. Rejoice!! It was and not any fair but the 1893 Columbian Chicago Worlds Fair. The legend of my oldest fair rose up and tapped me. Better yet, it was only 2 bucks. 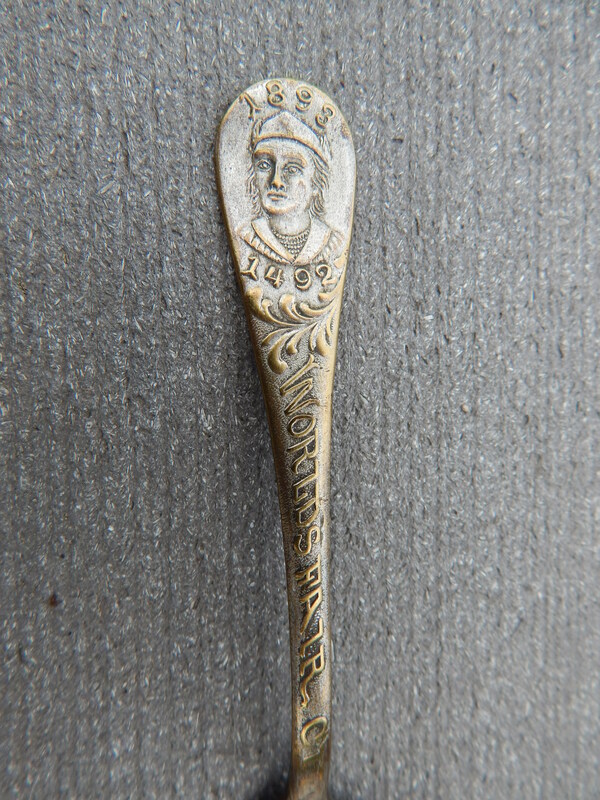 This little spoon is part of a set that has Columbus’ head on the top with 1492 to 1893 around him. 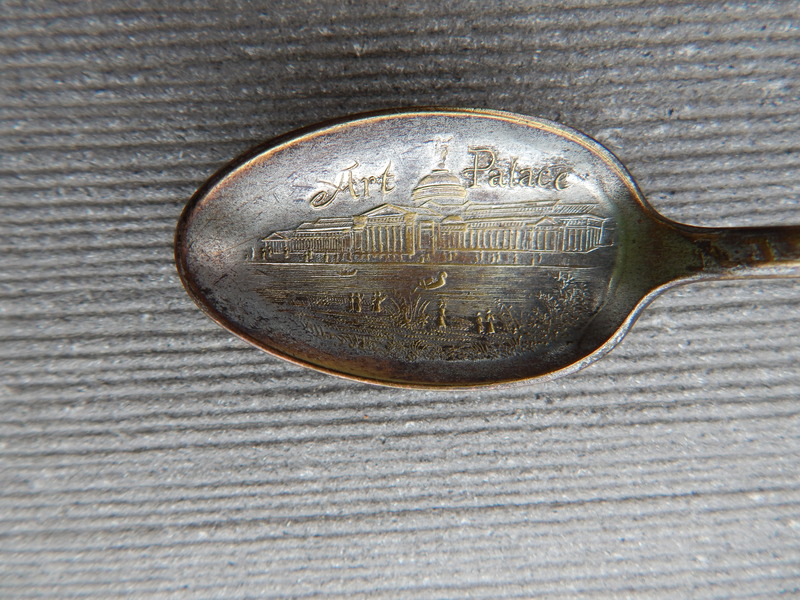 The shank of the spoon has on it Worlds Fair City. The bowl has a view of the Arts Palace. 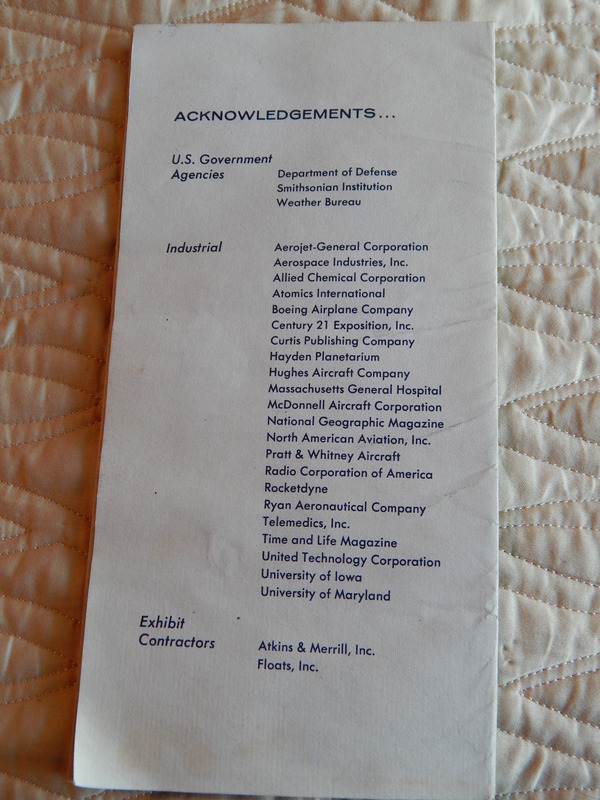 On the back it states Standard. It has been loved so much the brass/copper core is shining though on the raised areas. No wonder the other buyer passed it up. Not pure sterling. For me it was like finding gold. This is one of the most unusual items I have found. 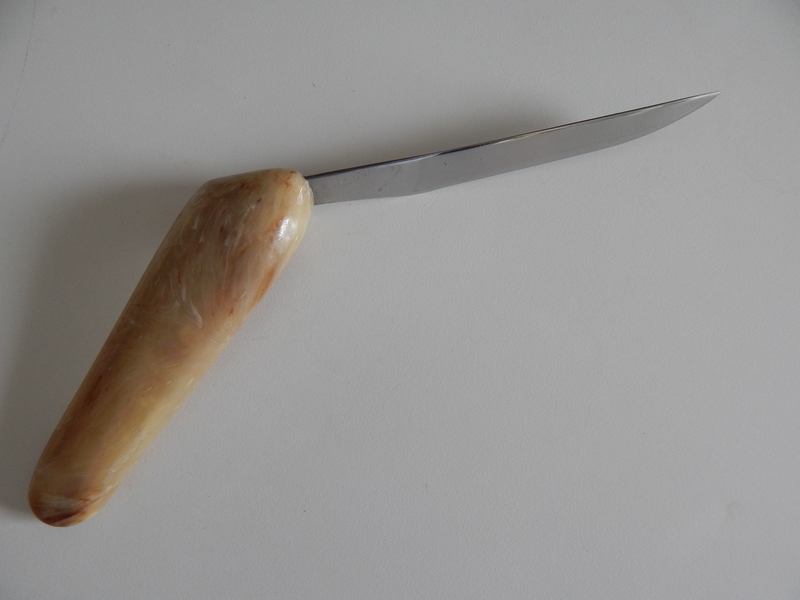 It is an ergonomic letter opener that is from the 1962 Seattle Worlds Fair. 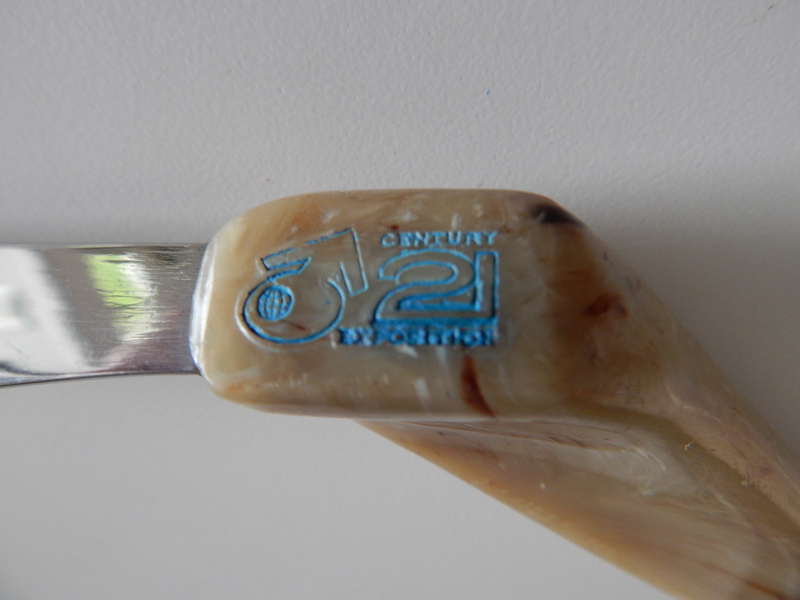 As you can see it has the Century 21 logo stamp on the flat part where the blade meets the handle. Here is a closer look at it. 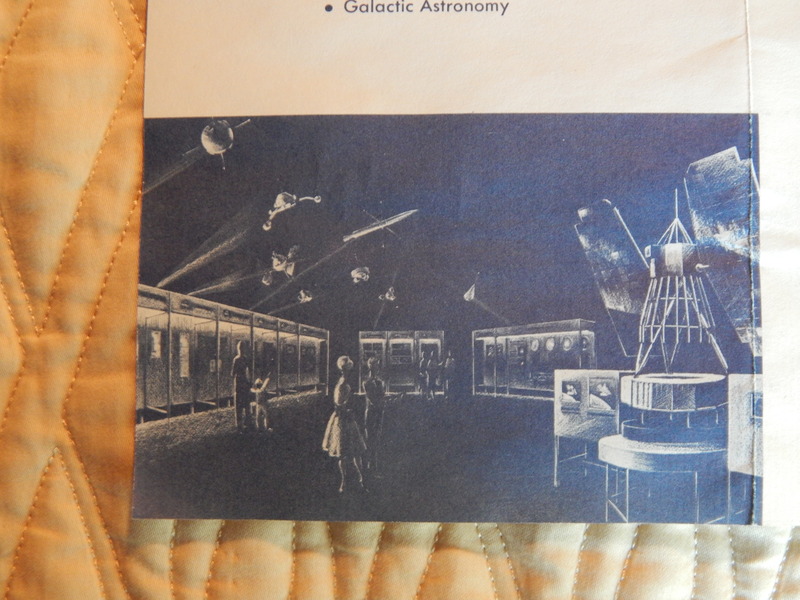 Finding items for my Worlds Fair Mini Museum is always an adventure. This one did not disappoint. The sale was on Capital Hill and I got a little lost. I knew I had gone too far north and pulled over to figure out how I had gone wrong. There had been a wreak on I-5, so I got off and went through the back streets. That was my down fall since I approached it from a different angle. I found the place and it was more of a professional than private sale set up in a house. 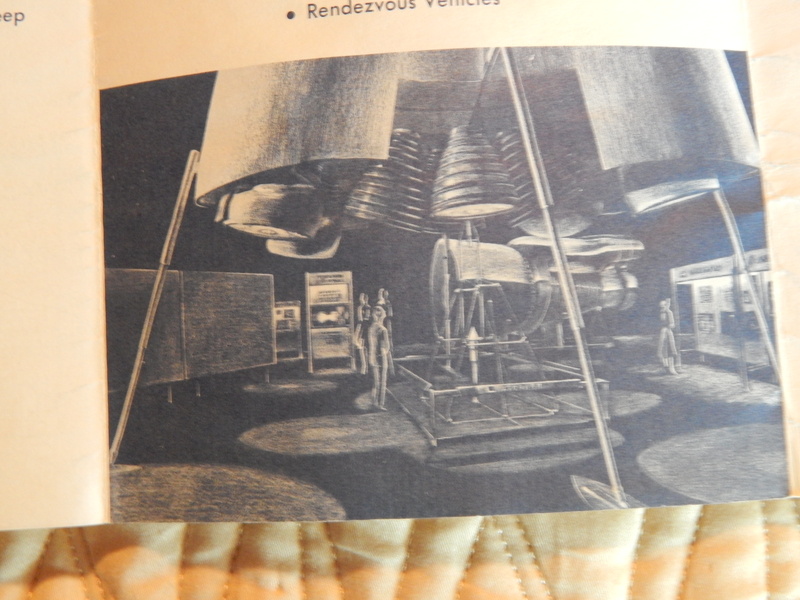 The photos on Craig’s list had a Seattle Worlds Fair cup in them. So, what did I have to lose but go see if I could snag this little thing. I am too late and the item is sold, which is fairly common. When I asked the owner of the sale, he told me it was gone but he had an ergonomic letter opener. It was not on display and he went upstairs to retrieve it for me. It is certainly unusual. He told me he had two of them and when I tried to barter on the price he won’t budge. 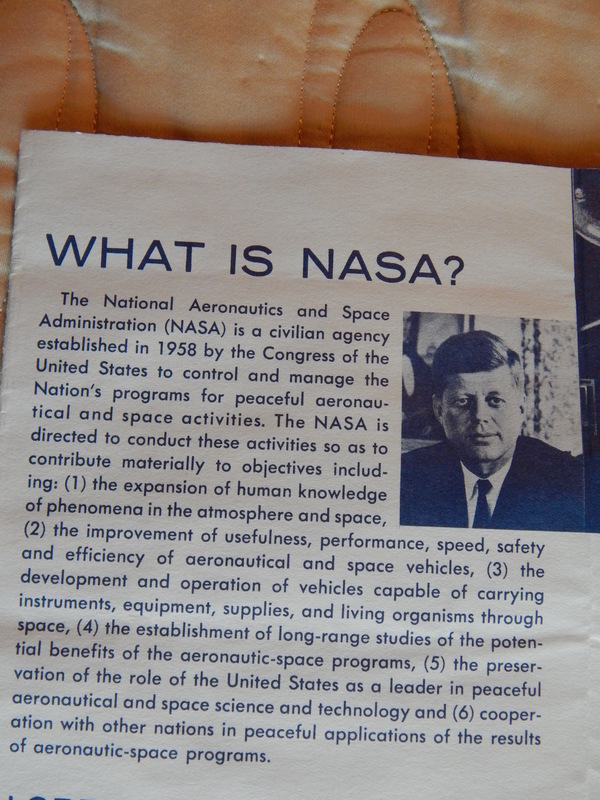 Before I talked to him I had picked up a 1988 worlds fair spoon in its box. I asked if he would throw that in and he still wanted 5 dollars for that. Having bought some of these items I knew that was over priced. As you can see I bought the letter opener and left the spoon behind. 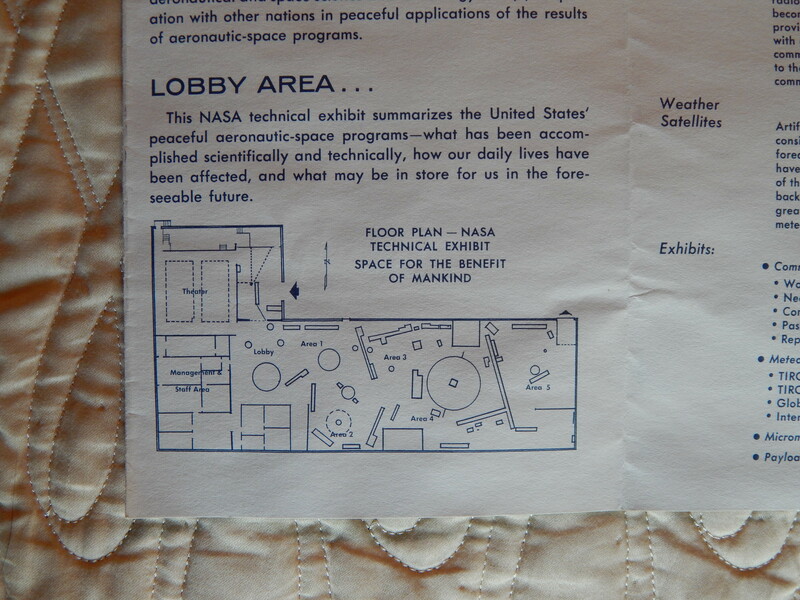 The NASA Building at the Seattle Worlds Fair is sort of dear to my heart. Not from going there during the Fair but how in the early 80s I worked in the building at the Seattle Gift Show. By then the building had been converted to a storage area for seating and other things next to the Seattle Coliseum aka Washington State Pavilion or Key Arena. In the years before the Washington State Convention Center, the Seattle Center grounds including the old Worlds Fair buildings were the places we in Seattle held Tradeshows. 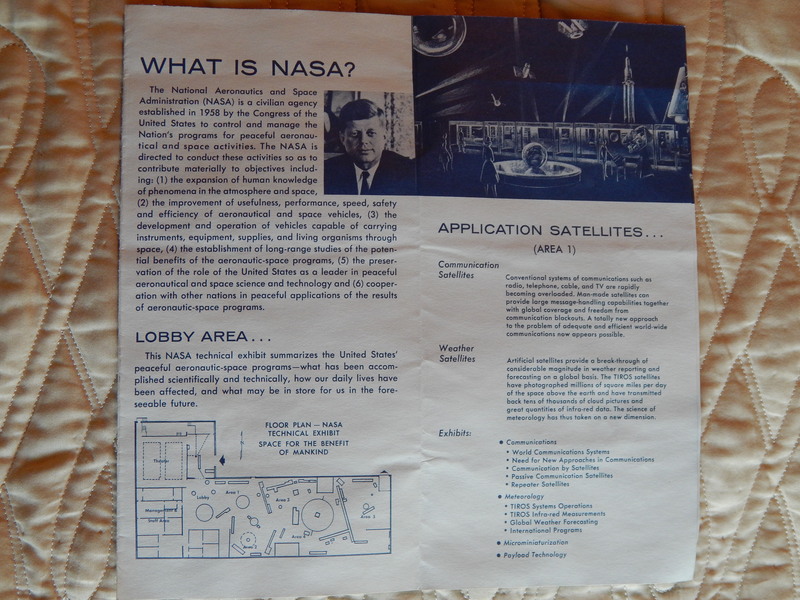 The Coliseum was the main building but when a show was larger than it could hold, they would overflow into the Flag Pavilion, Northwest Rooms, Exhibition Hall and the NASA Building. 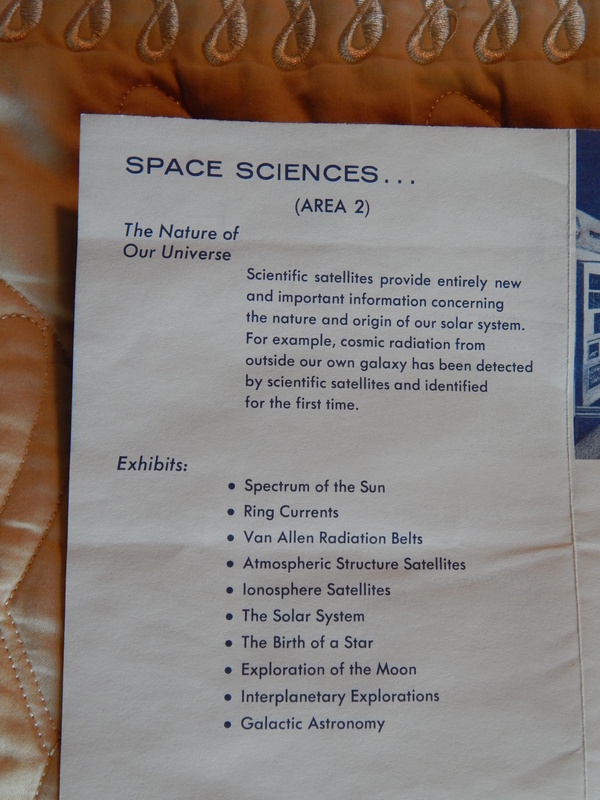 This weekend I went to a private estate sale that had advertised World Fair Paper. 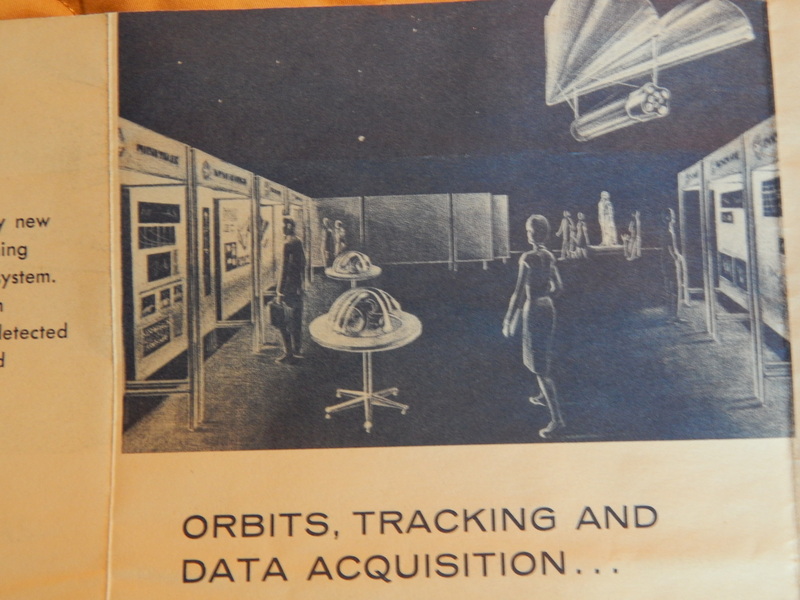 I found a small honey hole of memorabilia with not only this brochure but glasses, ashtrays and plates. Plus a first day edition envelope postmarked the first day of the fair. 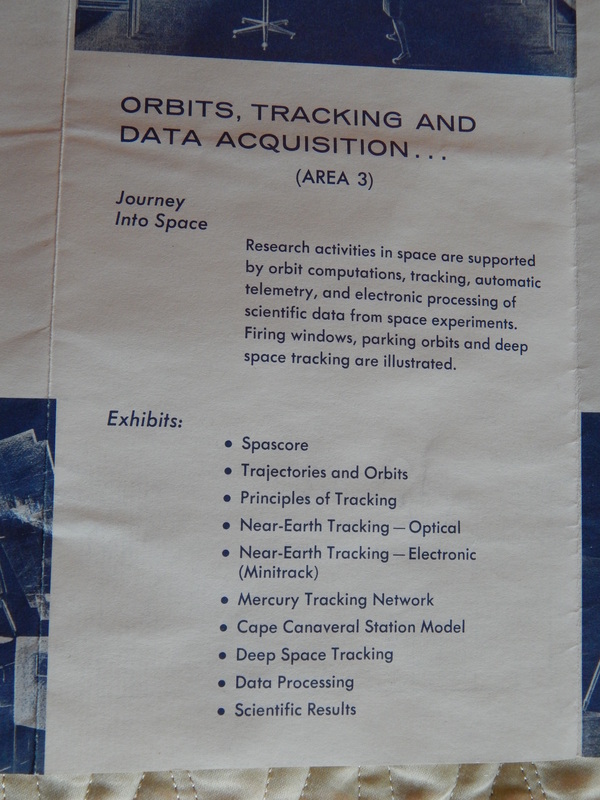 Hope you enjoy the brochure and how this small building way off in the corner of the fair grounds talked about space. 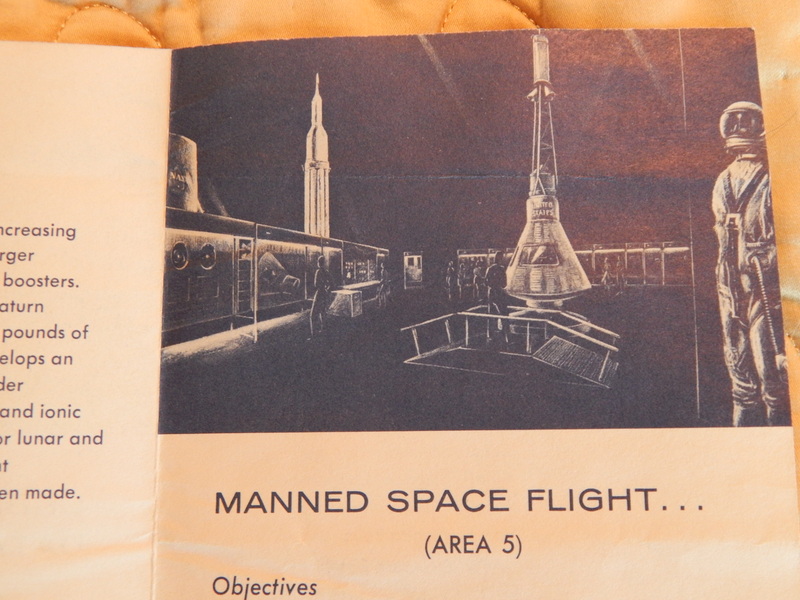 The first page had a welcome from President Kennedy, the floor plan of the exhibits and Area One – Application Satellites.